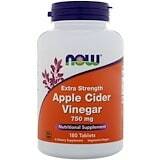 NOW Apple Cider Vinegar is derived from the natural fermentation of sweet apple cider. Vinegar has been used worldwide for more than 2000 years for various culinary purposes. More recently, it has been recognized for its acidic properties. Vegetarian coating, stearic acid (vegetable source) and silicon dioxide.